Two big, overlapping events are approaching for SUNY Oswego. Return to Oz V -- a reunion for alumni of color -- will run Oct. 12 to 14, and the college's annual Homecoming, featuring a tailgate event, will take place Saturday, Oct. 13. OSWEGO — SUNY Oswego hosts two big events in mid-October: Return to Oz V — a reunion for alumni of color — Oct. 12 to 14, with the college’s annual Homecoming unfolding Oct. 13. Two big, overlapping events are approaching for SUNY Oswego. Return to Oz V — a reunion for alumni of color — will run Oct. 12 to 14, and the college’s annual Homecoming, featuring a tailgate event, will take place Saturday, Oct. 13. The reunion, which takes place every five years, will include a Friday evening get-together, plus a Saturday networking fair, EOP Alumni Reception and the Return to Oz Celebration Dinner, among other events. 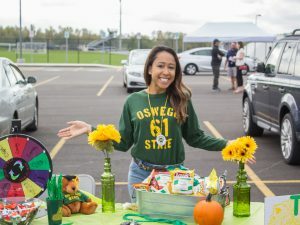 Oswego Alumni Association board member Thaina Gonzalez of the class of 1992 said the events are the perfect opportunity for alumni to reconnect with their alma mater. Homecoming events on Oct. 13 will include a Homecoming tailgate in coordination with Oswego State games: volleyball will take on Union College at noon; men’s soccer will face Fredonia at 1 p.m.; and field hockey will host St. John Fisher at 4 p.m.
Later, the annual induction for the Oswego Athletic Hall of Fame will welcome several exceptional athletes. This year, the inductees are Joe Carrabs, class of 2004, hockey; George T. Gelsomin, class of 1978, golf; Paul Newman, class of 1983, wrestling; Mark H. Serron, class of 1981, lacrosse; Sheri A. Smith, class of 1991, basketball and softball; Barbara Verdoliva Carroll, class of 1993, soccer; and Gregory Arthur Wilson, class of 1968, basketball. Registration for the dinner can be made at alumni.oswego.edu/homecoming. Homecoming events will also include the annual Scholars Breakfast, which brings together student scholarship recipients with the donors who funded their awards. – Green and Gold Day: Members of the Oswego family can celebrate wherever they are by wearing Oswego gear and posting a picture to Facebook, Twitter and/or Instagram, using #OswegoPride. – Athletic Hall of Fame Dinner: 5 p.m. reception; 6 p.m. dinner in Sheldon Hall ballroom. Advance online registration is required at alumni.oswego.edu/homecoming. – Return to Oz Celebration Dinner: 6 p.m. reception; 7 p.m. dinner in Hewitt ballroom. Advance online registration required at alumni.oswego.edu/homecoming (by Sept. 28). For more information on Homecoming events, visit alumni.oswego.edu/homecoming.